Blood Lions follows acclaimed environmental journalist and safari operator Ian Michler, and American hunter, Rick Swazey, an American hunter, on their journey to uncover the realities about of the multi-million dollar predator breeding and canned lion hunting industries in South Africa. The story blows the lid off claims made by these hunting operators in attempting to justify what they do. Last year alone over 800 captive lions were shot in South Africa, mostly by wealthy international hunters under conditions that are considered anything but sporting. Ian has been following this story since 1999, and the film shows him going onto these breeding farms to witness the impact that decades of intensive breeding is having on captive lions and other predators. Aggressive farmers and many others within the professional hunting community resent his questioning, but the highly profitable commercialization of lions is plain to see – cub petting, volunteer recruitment, lion walking, canned hunting, trading and the new lion bone trade are on the increase. And all are being justified under the guise of conservation, research and education. In parallel the film follows Rick, who purchases a South African lion online from his home in Hawaii. He then travels to South Africa to follow the path paved by many canned hunters. We also speak to trophy hunters, operators and breeders, as well as recognized lion ecologists, conservationists and animal welfare experts about the predator hunting industry. There is also hope in our story as we cover the latest developments with the Australian government announcing a complete ban on the importation of all African lion trophies into Australia. 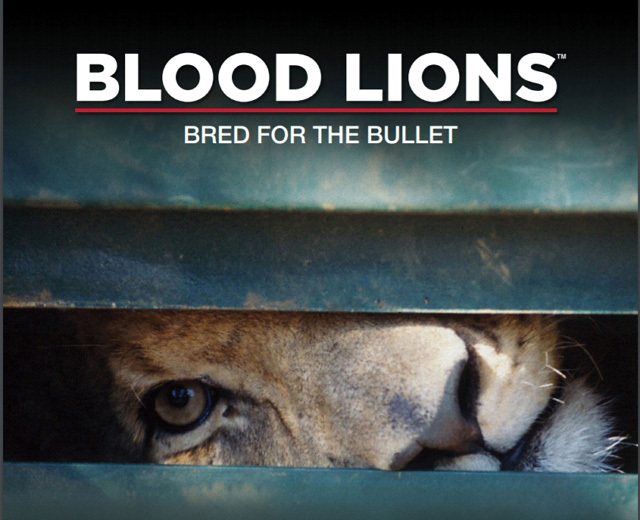 Blood Lions is a compelling call to action and shows how you can get involved in a global campaign to stop lions being bred for the bullet.